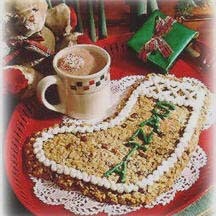 Festive oatmeal cookies, studded with dried cranberries and chopped almonds, shaped and decorated liked holiday stockings. Heat oven to 350°F (175°C). Lightly grease two cookie sheets. Beat margarine and sugars until creamy. Add egg, milk and almond extract; beat well. Add combined flour, baking soda and salt; mix well. Stir in oats, dried cherries and almonds; mix well. Divide dough into 4 equal portions. With moistened hands, pat dough onto prepared cookie sheets into 1/4-inch thick holiday shapes such as stockings, Christmas trees or candy canes. Bake 12 to 14 minutes or until edges are light golden brown. Cool 2 minutes on cookie sheets; remove to wire rack with wide spatula or pancake turner. Cool completely. Variation: For easy drop cookies, heat oven to 375°F (190°C). Follow recipe as directed above except drop dough by rounded measuring tablespoonfuls onto ungreased cookie sheets. Bake 10 to 12 minutes or until light golden brown. Cool 1 minute on cookie sheets; remove to wire rack. Cool completely.